Have you noticed that none of the synthetic decking manufacturers promise “No Maintenance” anymore? The most they’ll claim now is “Low Maintenance”. But what does “low” mean? Will you have to scrub your new deck once a month or just hose it off once a year? And why can’t you have “No Maintenance” anyway? Are you confused? There is a variety of answers here because there is a variety of decking products on the market. Let’s start out simply. What can happen to a deck that requires maintenance? There are several threats: Color Fading has almost disappeared (pardon the expression). 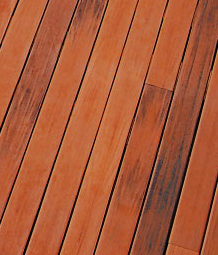 The sun’s Ultra-violet rays can bleach the color from wood and from the earlier, “first generation” composite decking. But almost all manufacturers now make decking that is color-fast, especially the 3rd generation products. 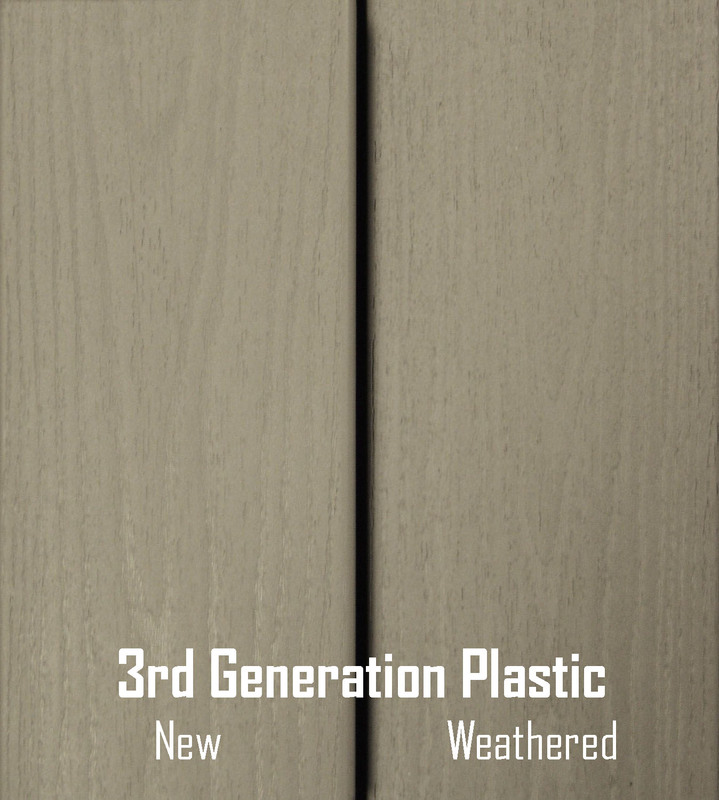 (For an overview of how synthetic decking evolved, see the article “Wood vs. Synthetic Decking”). Short of a manufacturing defect (and these do occur), any synthetic decking you install today will hold its color fairly well. You will not have to re-stain it ever. Here’s the fading you can expect: Mold or Mildew can grow on any surface. Mildew spores are everywhere, and all they need, (beyond air) is reasonable temperature, a food source, and moisture. Mold spores like the same temperature you like. And they are not picky about their diet either. Tiny amounts of almost any dead organic matter will do: dirt, wood fibers, paper, even paint. 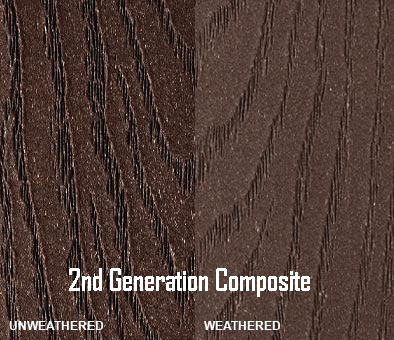 Composite decking is composed of plastic and wood fibers, and when those wood fibers get wet, they provide a feast for mold. Newer decking is all plastic, which, by itself, does not feed mold. Still, wet dirt or pollen, etc. will entice mold to grow even on plastic decks. So mold is a threat to any shaded deck that gets moisture. Happily, the sun’s ultra-violet rays kill mold, so a deck in full sun all day can expect no mold. Stains come from red wine, steak dropped from the grill, and wet oak leaves. The sooner you remove the source, the better. The porous wood fibers of composite decking soak up stains and are hard to clean. Newer decking has a hard, all plastic coating that most stains cannot penetrate. Someone drags a metal chair or drops a knife, or the umbrella table blows over – numerous things can scratch a deck. Light scratches on wood can be fixed: just sand, re-treat, and wipe off. On synthetic decking, though, sanding just damages the decking further. (One manufacturer claims that a stiff wire brush or a soldering iron will disguise a scratch. I’m skeptical.) 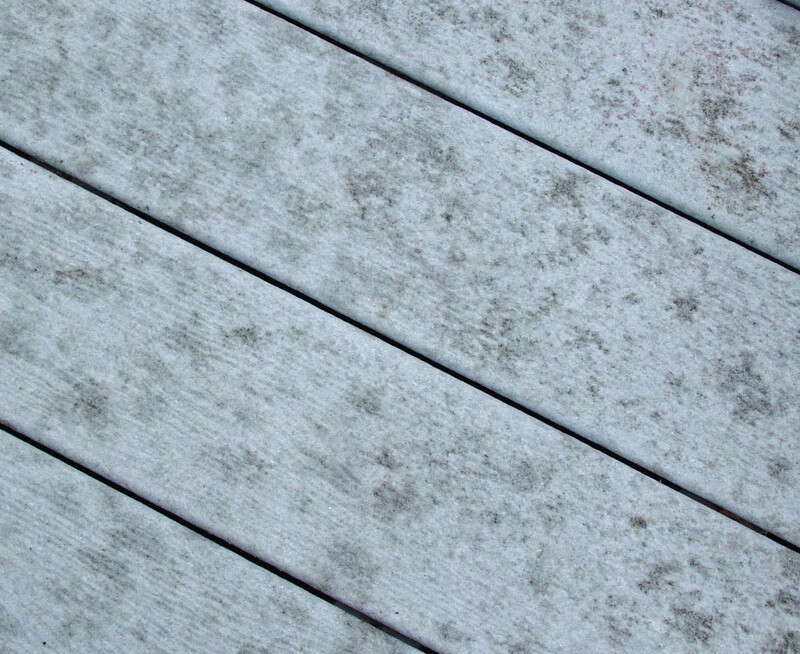 The hard coatings on all-plastic decking resist light scratches. Deep gouges, from the sharp leg of a heavy grill, however, will deeply damage any decking. Correct Deck® offers a “Care Kit” for its CX decking that includes an epoxy filler for “deep scratches”. Otherwise, your only fix is to replace the deck board. The introduction of Procell® years ago dramatically changed synthetic decking. Composed almost entirely of PVC plastic, Procell (now called TimberTech Azek®) claims to resist stains, mildew and scratches. It does. Red wine does not penetrate it, minor events do not scratch it, and since it lacks an inherent food source, mildew has trouble getting started. All the major manufacturers now offer plastic or plastic coated decking that greatly lowers maintenance. Probably the most durable – hardest and most resistant – is DuraLife®. Its polypropolene plastic coating is harder than the polyethelene used by other manufacturers. But its shiny, “all plastic” look has limited appeal. Trex Transcend®, TimberTech® Legacy, and Azek®’s Vintage series have more natural looking grain patterns and are more popular. They all resist stains, mildew, and scratches fairly well. So, drop a hamburger, spill red wine, or squirt some mustard on the deck. If you clean it with soap and water within a day or so, it will leave no permanent stain. Undoubtedly, there are some substances that will stain even hard plastic decking – perhaps concentrated rust, acidic leaves, droppings from a flock of birds who just consumed an entire blueberry patch. These may need special attention. And if you regularly grill on your deck, I’d advise using a non-rubber “grill mat” underneath to catch greasy drips. In shady, moist sites, mildew can still grow, but you can blast it away with a strong garden hose. If mildew grows unchecked for several months, you may have to lightly scrub your plastic deck with a mildewcide. Are you afraid that “plastic” decking will be shiny and ugly? Don’t be. The newer, 3rd generation synthetic decking looks quite good. The best has random dark streaks that mimic real wood, or a life-like texture that looks like well-painted wood. (In a moment of cowardice, I ordered these alphabetically.) The better (and more confident) manufacturers have specific warranties against stains and fading. Nice. Do you feel better now? At Archadeck of Suburban Boston, we offer professional design and build services for clients west and north of Boston. Over the past 26 years we have designed and built over 950 projects, including more than 240 low maintenance decks. We have enhanced the depth of our expertise by limiting our work to decks, porches, and sunrooms. To view some of these projects, visit our website. To learn how we treat our clients, check us on Angie’s List or read about us in a recent article in Remodeling Magazine. For a free design consultation and a relaxed and rewarding experience, contact us via e-mail, subboston@archadeck.net or by phone, 781-273-3500. © 2010, 2019 Advantage Design & Constr., Inc.
How do I remove a metal mark from 2nd generation axek deck 2014 made from swinging golf club across did not penetrate surface. Kathy, Metal scuff marks? I am not sure. Try Azek’s standard cleaning instructions: “Use all-purpose cleaner and dilute all cleaners by 50% (Do not use full strength) , such as Chomp Gutter cleaner, Zep 505, Simple Green or Krud Kutter Cleaner/Degreaser with a stiff natural fiber brush. Do not use abrasive cleaners which can dull the surface of new deck boards.” Do you have any spare decking to experiment on? If not, you may be able to get a few spare samples from a local lumber yard. Then release your golfer from the dog house long enough to recreate his crime on a spare board, so you can experiment with solutions. Good luck. Amber: If the hole does penetrate all the way through your decking, all you can do is replace that board. If your decking is wood, you my be able to sand out a scratch. Almost any type of damage to synthetic decking leaves you two options: replace the board or just live with it. How do I get dog nail scratches off my plastic deck? Is this possible? Nicole: I am not optimistic. What kind of “plastic decking” do you have (manufacturer & type)? The newer decking types are “scratch resistant”. the no maintenance decks are totally maintenance free for a long period ? so you never have to put a water seal on these products? You should never “water seal” or stain any synthetic, “low maintenance” decking. You’ll probably need to sweep and hose off these decks to clear off debris. True composite decks (second generation decking composed of wood fibers and plastic) are vulnerable to mold in shady sites. Those may require occasional cleaning with a bleach solution to kill the mold. Plastic decking (like Azek, TimberTech XLM, Fiberon Horizon, Trex Transcends,…) are truly “extremely low maintenance.” The warranties vary from 20 years to life. You know, you give so many reasons why anyone in her/his right mind should want a synthetic/plastic/composite deck. Who wouldn’t want to just kick back, wash it once in a while, save money, and have those blow-out BBQs with greasy burgers and wine (?!) Why would you want wood after all if the others look so much like the real thing and are so much easier and less expensive to maintain, unless you’re a purist?